How do I avoid taking my RMD? Every year droves of people (approx. 4 million) will approach the finish line of their working career and retire from the U.S. workforce. Even more staggering, individuals age 65 years or older make up over 41 million people as noted in a Kaiser Family research study; meaning nearly 20% of our population is no longer getting their traditional paychecks they’ve long grown accustomed to. If you’re one of the fortunate retired individuals who planned ahead and funded a retirement account (IRA) throughout your career or have/had a 401k, read on as this article on Required Minimum Distributions (RMD) will apply to you. So what is an RMD? 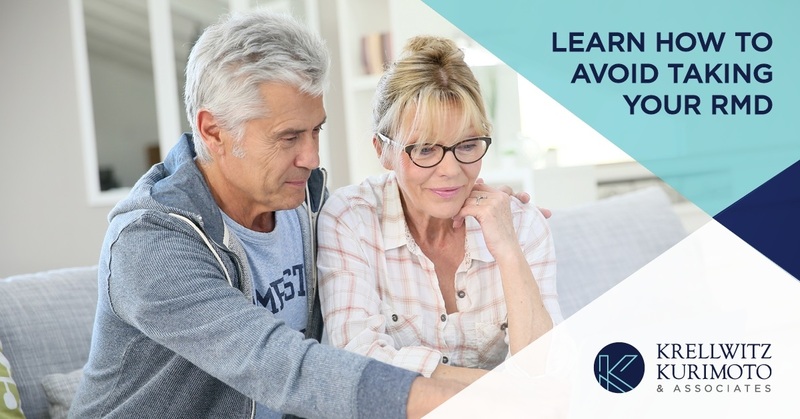 RMD stands for “Required Minimum Distribution” and is essentially a rule created by the government that makes it MANDATORY for you to begin taking out distributions from your retirement account once you reach the age of 70 ½.
Doesn’t seem fair, does it? Keep in mind, way back when you first started contributing, you received a tax deduction for any dollar you put into your tax-deferred IRA. Furthermore, you didn’t pay any capital gains taxes on the growth of your investments as the account value increased over all those years… well, now it’s time to pay the government and RMD’s is the way in which they accomplish it. How much do I have to take out? Quick answer….It depends. Here’s a helpful example to explain. Each year your RMD amount will vary…and increase. The two factors the US Treasury uses to determine your RMD value are: Your age and your IRA account value as of December 31st of the prior year. 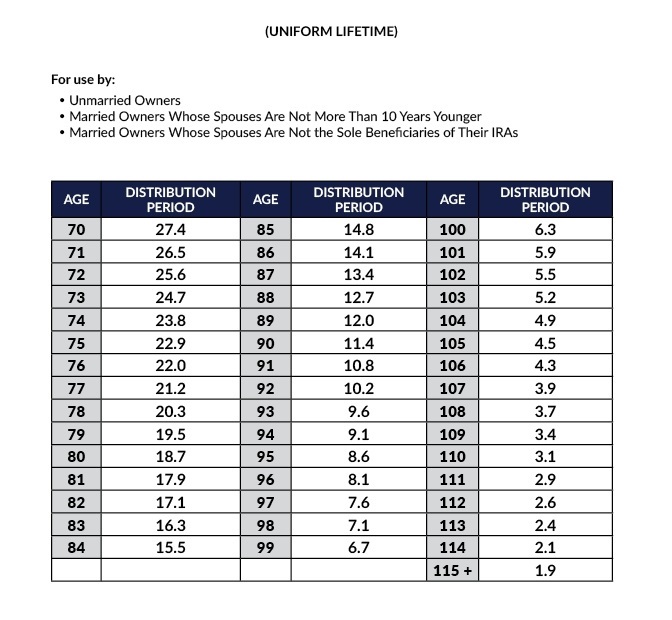 Using your age, you are assigned a “Distribution Period” factor (see table below). To solve for your RMD, divide your previous year’s balance by your “Distribution Period”. For example: If your 2016 IRA account balance was $250,000 and you are in your first year of your RMD, you would simply divide $250,000 by 27.4 (Age 70 – 27.4) , making your RMD total $9,124. In year 2, let’s say your 2017 ending account balance is now $265,000 because of an up market. Your RMD amount is calculated by dividing $265,000 by 26.5 (71 y/o), which comes out to $10,000. The table below is the main table to work off of, however there are different table to use depending on your age, situation and marital status. *Consult with your financial advisor and/or Tax Professional to make sure your taking out the correct amount. Yes. All money taken out of your IRA is treated as “Earned Income” for your current year’s tax return. What can I do with my distributions? Invest it: Once it’s been taxed, you are free to invest your RMD into any taxable account (Trust, Joint). Enjoy it: Send it right into your bank account or have a check sent to you and do whatever you please. Can I avoid taking my RMD? Feeling philanthropic? If you’d like to forego receiving your RMD and paying that tax bill, one way to avoid your RMD is to give it away. Gift it: To pull this one off, you must transfer the money directly from your IRA to a ‘qualified’ charity for it to be considered tax-free. Doing this ensures your RMD is not included in your Adjusted Gross Income. Keep in mind, if you choose to receive your RMD first and then give it to charity, the gift will be included in your adjusted gross income and will need to be deducted from your adjusted gross income (assuming you itemize). Convert to a Roth IRA – All withdrawals from a Roth IRA are tax free and Roth IRA’s are not subject to RMD’s. Careful though, converting to a Roth IRA from a Traditional IRA is a taxable event and could push you into a higher tax bracket. This one’s definitely worth taking a second look at and running by a financial advisor or tax professional. Delay it: You can delay your very first RMD until April 1st of the following year. This means though, you will be required to take 2 RMD’s in the following year. RMD 1 will be due by April 1st and RMD 2 is due by the standard December 31st deadline. Keep On Working and Delay – If you have a 401k and are still employed past 70 ½ , you are able to delay (key word there) your RMD until you quit or retire. The only two things you cannot do is refuse to take it and second, put it back into your retirement account. What if I don’t take it? Please don’t make this mistake…it’s a costly one. The government applies a 50% penalty on you for every dollar you do not withdraw from RMD amount. Required Minimum Distributions are a normal part of retirement that most retiree’s experience. Having an advisor to help walk you through all your options and apply the one that makes the most sense to your situation is imperative. Distributions can be taken at any time throughout the year or once a year in one lump sum; it is taxed the same either way. Most commonly, your advisor will assist you in setting up automatic distributions to run throughout the year (based off RMD calculations) to ensure you satisfy your requirement. We understand RMD’s can be tricky and the options around planning for taking them are many. If you found this article helpful or have questions regarding your Required Minimum Distribution, please do not hesitate to reach out and contact us as we’d be happy to assist.